Our product range includes a wide range of dop checking gauge for gear. Adhering to our qualitative production, we have gained the client's faith towards our vast assortment of DOP Checking Gauge for Gear. The offered checking gauge is excessively known for its impeccable finish, low maintenance and long service life. 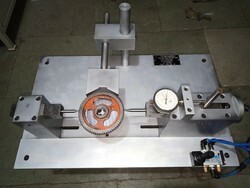 We avail this checking gauge with adjustable V-rest that facilitates ease of checking for the operator. Furthermore, we offer it in the multitude of technical specifications at the competitive price. Reading can be displayed on the digital Display Unit. The Adjustable V-rest enable the operator for easy of checking. The Odd & Even no. of teeth D.O.P. also can be checked with this system. With the electronic D.R.O. the system the status of D.O.P. also can be indicated with status indicating lamp by setting Hi & Low Tolerance checked component & actual size of DOP with the status indication.